​Click on the Soundcloud link below to hear some Motomouth examples. First launched on Kickstarter (31 March 17). 75 units 'backed' for the first batch. Motomouth is an analogue 3-Band, Sedra + Espinoza Bandpass Filter (DABP) with resonant frequencies that are tuned to the same resonant frequencies found in the human mouth and nose cavities, and these can be varied, independently, to form different 'mouth shapes', to emulate vowels such as A, E, I, O and U. Motomouth can emulate 16 vowels and 'morph' or 'glide' between each vowel using a single Control Voltage input (1V/Oct), and a Gate to 'snap' to each vowel when required. Two of the bands (F1 and F2) are used to form the mouth cavity, and the third band (F3) is used to from the nasal cavity, which is reasonably static. Varying F3 makes little significant difference 'in the mix', but having it is important. The single Control Voltage is decoded to control F1 and F2 independently, because the frequency bands for each vowel are not proportional to each other over the vowel range. So Motomouth has learned how to 'speak', so to speak, but it still needs to learn more, and that's were you come in. Single CV to control and set vowel shapes. Automatic Morphing and morphing rates to each vowel. Pure analogue single path from input to output. Gate operated snap to each vowel when required. Sedra+Espinoza Analogue Filter design for a high, sharp Q value and a 12 dB/octave roll-off slope. Plays well from a monophonic keyboard or Midi Keyboard through a Midi to CV/Gate converter. 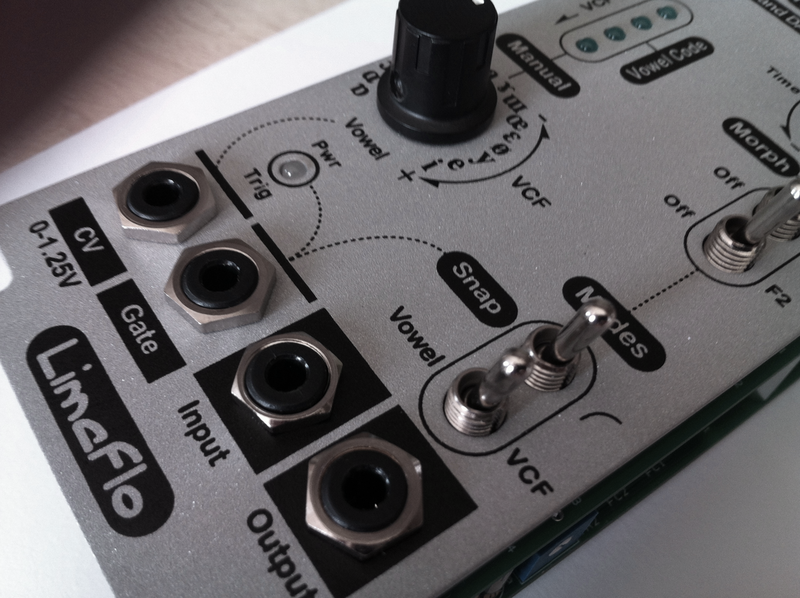 Works great with a CV Step Sequencer. Filter and vowel mode selection using the same single CV input. Motomouth is a Monophonic processor. Stereo can be achieved by double tracking or by using two Motomouth modules.